If you enjoy reading, books, or libraries, you’ll really enjoy visiting Prague. 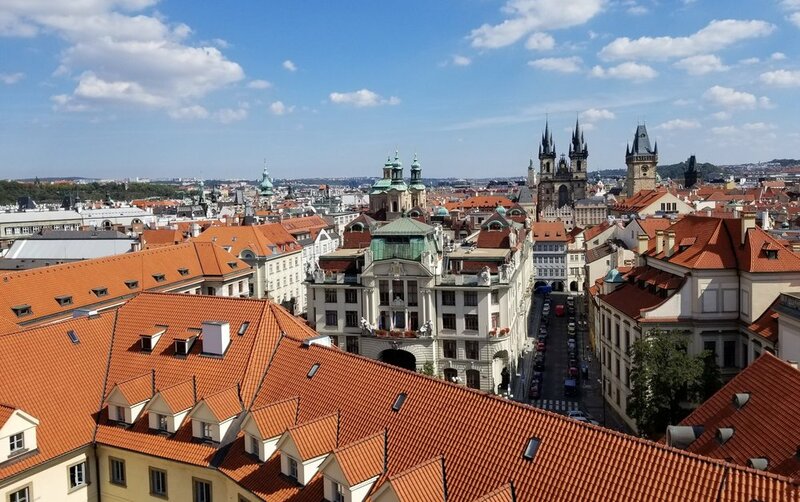 Or, if you hate reading, books, and libraries, but enjoy beautiful old spaces where all you have to do is pretend to love reading, books, and libraries, then you’ll also enjoy Prague. I’m not going to identify which of these groups I fit into, because that’s not relevant to this discussion. 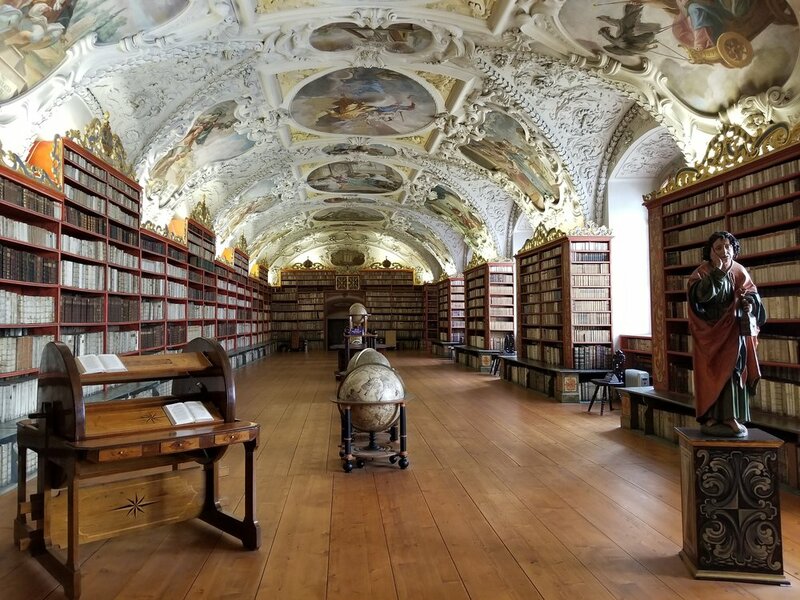 What I can tell you is that Prague has some pretty magnificent old libraries that are quite the sight to behold, regardless of your love or hate for the process of actually reading books. Both the libraries I will highlight for you here are truly magnificent, but neither was particularly overrun with tourists as many of the other famous landmarks in the city, and for that reason alone I'd highly recommend them. The first, and probably more notable of the two, is the library within the Klementinum. The Klementinum is a complex of old buildings dating back to the 11th century. It began as a monastery and was later a Jesuit University. The outside isn’t particularly remarkable, and you might even fail to notice it amongst all the historic architecture in the city. However, it is extremely easy to find as it is on the left side of the main pedestrian thoroughfare immediately after crossing the Charles Bridge from west to east. While the Church of St. Salvator is attached and is part of the same complex, you cannot simply enter or exit as you please like you can with the church. In fact, the only way to get inside of the Klementinum to see both the library and the astronomical tower is with the twice hourly tours that are offered. I was told that the tours do fill up, so you might want to arrive an hour before your desired tour time to secure your ticket. To access the ticket office, you’ll need to turn left into the courtyard from the street and look for the office on the left. The tours are cheap and last about half an hour or 45 minutes. I found the tour to be well worth the cost of admission because you get to see not only the library, but also go up to the top of the astronomical tower, which offers some of the best views in the city. Unfortunately, the rules strictly forbid photography of the library itself, and although the tour guides are very kind, they do seem to take the no photography rule pretty seriously. I was told the rule against photography had to do with the library’s importance as a piece of Czech history, but frankly, you will probably forget the reasons for the rule when you get your first look at the inside – it really is incredible to behold (google it). Part of the reason the tour guides are able to enforce this rule is that you really only have one opportunity to look inside the library, and only from an open doorway with a railing. My tour had about 20 people, and 4 or 5 at a time were allowed in the doorway to take a look for a minute or two, but of course not take any pictures. Interestingly, photographs of the library are available for purchase from the tour office. So yeah, maybe the prohibition of photography is more of a business guideline. If your lack of a cool Instagram post saddens you and you don’t want to be a jackass who posts a picture of a picture, but do want to be a jackass who captions a library picture “curled up with a good book in Prague,” then fear not, this jackass has you covered. There is still a beautiful library to suit your needs. Back across the river and up the hill lies the Strahov Monastery. The people running this joint are pure capitalists. You pay admission, and pay a few extra bucks for the privilege of taking pictures. You really should just pay the extra couple of bucks for the photo badge, but you might be able to get away without it if you are the kind of person who gets their jollies ripping off a religious organization (don’t worry, no extra fee for photography privileges in hell). I’m only joking of course, I have no idea who actually is responsible for the monastery’s operations in 2018. There are staff around, but no tour guides, and you’re just sort of allowed to go in and look at whatever you please. There is also a gallery on the premises, but that is a separate ticket, as well as a café, chapel, and extensive gift shop – like I said, capitalists. There are two library rooms which you can gaze into from open doorways with railings for as long as you please. There is also artwork and old zoological collections you are free to look at, and of course photograph if you have the necessary paperwork. The place is beautiful and again, well worth the price of admission. While it certainly isn’t off the beaten path, it’s nowhere near as crowded as the other popular landmarks in the city. Go get yourself some bibliophile street cred.